Family law is what I do. I have practiced for more than 20 years and enjoy helping my clients with their family law and adoption needs. Heather has practiced all areas of family law and domestic relations in Pierce County since her graduation in 1997, from Seattle University School of Law. When asked why she enjoys practicing family law Heather indicates that she enjoys getting to know her clients; she enjoys that family law touches on many areas of the law, from taxes, to businesses, to real estate, to behavioral health; she enjoys a challenge and wants to help people navigate through a difficult time. Heather approaches family law with compassion and understanding. She likes to work cooperatively with opposing counsels and opposing parties, but is also a strong a zealous advocate when needed. 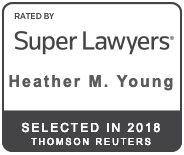 Heather has been and is active in local and state bar associations, as well a local non-profit organization. When not practicing law, Heather enjoys spending time with her husband, son and cats. She enjoys gardening, traveling, and reading.